You might think that in a bustling city like New York it would be difficult to find places to take romantic engagement photos. There are so many people and cars and stuff everywhere, but at the same time, the city is so full of life. Life fuels love, just as love fuels life. Some NYC engagement photos will have other people in the background--if they are distracting, we will edit them out. We can also use different camera angles to avoid the crowds and less pleasant pieces of the background (if you've spent any time living in a big city, you know what I'm referring to) and we can play with different focuses to blur people or distracting objects in the background. And here's the secret: even big, bustling cities have quiet corners and less busy times of day. The locations that mean the most to the couple (restaurants and bars as scenes of first dates) may be closed during part of the day, so there won't be a line out front. Popular parks are often crowded but most people don't want to get in the way of what is clearly an engagement portrait (a romantic moment between two people and their photographer with the giant camera). People will move out of the way naturally and if they don't, I'm happy to ask them to. 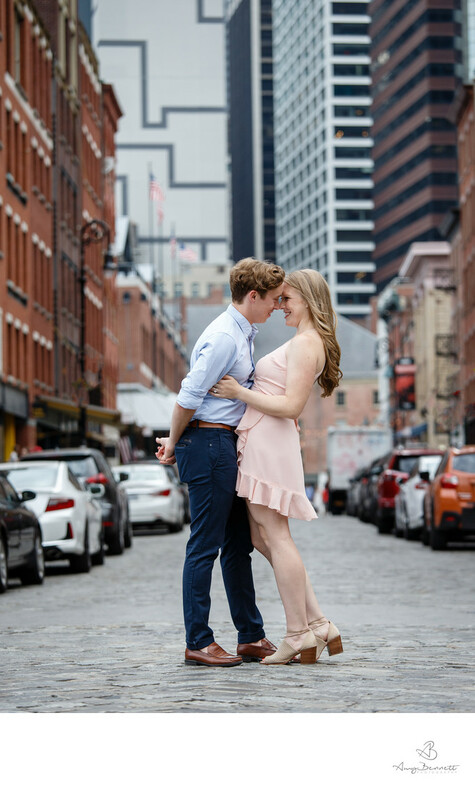 Just as finding the love of your life in a big city seems daunting, finding great spots to take engagement photos in a big city can seem impossible but truly, nothing is impossible when love is involved.